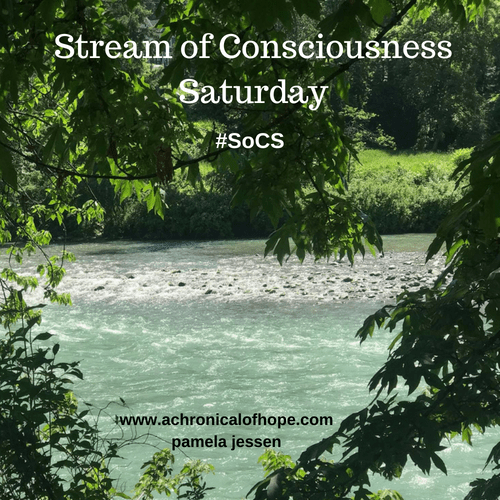 SoCS – “but salmonella!” Child, please. My childhood is a smattering of dough memories. Mom kneading dough to make her braided sweet bread. Finding that bowl covered with a dish towel, a sweet yeasty smell hanging in the air, was like Christmas morning. Licking the icing bowl after it’s gooey goodness was brushed across bread still warm from the oven ran a close second. So much of the yummy. Getting called to the kitchen table with my sister and brother once the Christmas cookie doughs were ready. We were recruited to ice the mountains of Italian cookies once they were laid out on wax paper, but the anise cookies required prep before baking. I’d break off pieces of dough, rolling them out on the table into small cylinder shapes. Tiny snakes ready to be twisted or turned in on each other, dropped onto a cookie sheet, and baked so they could get their own dose of icing. Year after year our hands paid tribute to the generations of family who’d come before, baking these same family recipes, honoring the Christmas traditions. I grew up in the cookie dough generation when popping a raw bite was par for the course. There weren’t any cries of “but salmonella!” – you ate the raw cookie dough and you were fine. My mom loved a peanut butter cookie and often handed me a fork to press the tops with their telltale X. It was probably a good job for the kid who wanted to help bake – quick, easy, hard to mess up. She also loved making chocolate chip cookies, and this was back in the day when all chocolate chip cookies were made “from scratch”. The concept of break apart refrigerated dough was unthinkable. There’s love in the baking and all that jazz. There were cake mixes and brownies and cookies and breads – so many wonderful memories wrapped up in baking sights, sounds, and smells. No wonder the kitchen is a magical place for me. These are such sweet memories. I can still taste that raw cookie dough. It was the only time I would stand around in the kitchen. Now son does the same sadly I still can’t get it to be as good as my mums. But I bet you anything that *he* thinks it’s the best thing on the planet. We are hard on ourselves, especially when it comes to measuring up to our mothers’ baking. While I am not afraid of the egg goo in cookie dough, I do not like cookie dough, or batter, and have always been odd in this way. My kids love both. They’re all okay. I love the way you traveled through this post. It felt warm and gooey and happy. I think we worry too much now and take a lot of little memory-making pleasures out of life. So much truth in that right there, Carol. Sweet memories. The raw dough was the best. No matter how many times I was told not to, I snuck a bite anyway. Great post. You can feel the love. I admit to both the tasting of the dough and being a mom that warned the kids not to eat too much dough. Your memories were fun to read! Happy Saturday to you! Thanks, Shelley. I hope you have a wonderful weekend! I’m charmed by your memories of it, but raw cookie dough was a big NO NO in my house. Of course the baked cookies were a big YES YES so there was a balance going on. I remember my grandmother baking, and I remember my wife backing. Cookie dough could not hurt you. Lovely post, Laura. Thanks, Dan. I think my mom learned a lot of her baking from dad’s family — carrying on the Italian traditions and all. She did them proud! I love this , and yes to all of this! 💛 Such precious childhood memories. Warm remembrances and a pleasure to read. Thank you. This one brought back wonderful memories.